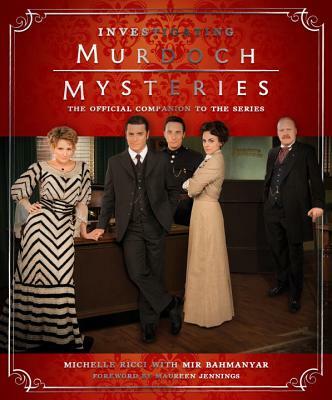 Based on Maureen Jennings' award-winning novels, at the end of the Victorian era, Toronto-based police detective William Murdoch uses radical forensic techniques, including fingerprinting and trace evidence, to solve some of the city’s most gruesome murders. His unconventional approach often elicits skepticism from his colleagues, though he is usually supported by his boss Inspector Brackenreid, young Constable George Crabtree, and doctors/pathologists Emily Grace and Julia Ogden. This companion looks at every aspect of all 8 seasons of the show, from the regular characters and their relationships, to the history of the period, including figures Murdoch encounters, the forensic and scientific advances he utilises, and Murdoch’s most notable cases. The companion also goes behind the scenes on the show to examine every aspect of the production, including sets, costumes, music and writing. ​Michelle Ricci is a television writer-producer. A graduate of the Canadian Film Centre, she is best known for her work on Murdoch Mysteries as a writer and producer since 2011. She has written 10 episodes of the series as well as the webseries The Murdoch Effect and Nightmare on Queen Street. Mir Bahmanyar has authored non-fiction books and articles specializing in current US special operations. In recent years Mir has been writing and producing films. He co-wrote and produced the award-winning motion picture Soldier of God and occasionally acts as a consultant to the TV and feature film industries. Maureen Jennings emigrated to Canada from the UK at the age of seventeen. Best known for the Murdoch Mysteries series, the TV adaptation of which has been running since 2008, Jennings has also launched a new contemporary series featuring a forensic profiler named Christine Morris. She lives in Toronto, Canada with her husband, two cats and two dogs.